Bill Ayers’ claim that the Weather Underground bombed property, not people, in order to protest the Vietnam War, is two lies in one. First, they specialized in anti-personnel bombs using heavy metal staples. Second, Ayers and his wife Bernardine Dohrn were not opposed to the war, only to a U.S. victory. As reported by Jim Mackinnon of the Akron Beacon Journal, Ayers maintained, during a speaking appearance, “No one died in the Weather Underground bombings.” He was trying to claim that the Weather Underground was different from the Islamic terrorists in the Boston bombings case. Five years ago we began our campaign to tell the truth about the Weather Underground’s bombing campaign against police and civilians with our article, Tribune Covers for Obama’s Terrorist Friends, about the failure of the Chicago Tribune to report evidence that the Weather Underground planted the bomb that killed Sergeant McDonnell. This was during the 2008 presidential campaign when Obama tried to distance himself from Ayers and Dohrn, who had sponsored his political career. Over the years we at AIM have reported these facts while the media continued to look the other way. Former FBI informant Larry Grathwohl has consistently testified about Bernardine Dohrn’s role in that bombing. His new and updated book, Bringing Down America, has that testimony. I confronted Dohrn about her reported role in planting the bomb that killed McDonnell. Our media ignore all of this. If Ayers was opposed to killing people, why were his fingerprints found in a bomb factory in San Francisco that included C-4, and stabbing weapons made to look like pens? Why did the Weather Underground kill police Sergeant Brian V. McDonnell? Why were Ayers’ comrades building anti-personnel bombs to be used at an officers’ dance at Fort Dix? They were the Weather Underground members who died in the bomb blast in a Greenwich Village townhouse, where they were constructing bombs. Mark Rudd, another member of the Weather Underground, revealed in his book, Underground: My Life with SDS and the Weathermen, that he was in favor of planting that bomb, saying that he wanted “this country to have a taste of what it had been dishing out daily in Southeast Asia…” What the U.S. had been trying to do was prevent a Communist takeover of South Vietnam. 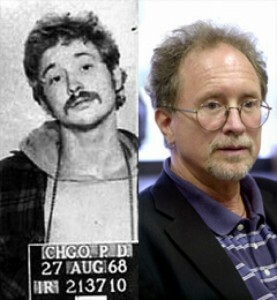 Ayers spouts his lies because he knows that he can get away with them. The media won’t report the truth because they know it would besmirch the reputation of President Obama, whose political career was launched in the Ayers/Dohrn home. The sins of the press are bad enough. But then we have the Southern Poverty Law Center, which inspired the terrorist attack on the Family Research Council, portraying Ayers as a respected academic. This is a group that is used as an objective resource on “hate groups” by Eric Holder’s Department of Justice. This is the problem we face today—the U.S. Government is run by associates of these terrorists and lunatics. The FBI’s designation of one of the Weather Underground’s favorite criminal terrorist associates, fugitive cop-killer Joanne Chesimard, as one of the Most Wanted Terrorists, is a potential game-changer. Law enforcement can now investigate her support networks here in the U.S.
Joel Gilbert, director of the film, “Dreams from My Real Father,” says it is likely that Barack Obama, when he was a student at Columbia, attended meetings of the May 19 Communist Organization, a support group for the Weather Underground and the Black Liberation Army. Two of their members are still on another FBI wanted list. “I had one source who ID’d Obama as having attended May 19 public meetings,” he tells me. He adds that Obama, in his book, Dreams from My Father, describes attending several events in New York City (such as a Malcolm X movie screening) that are identical to documented May 19 events. Obama’s Marxist background and connections are the story of a lifetime. It’s a story the media “forgot” to cover in their rush to make him President. But the whitewashing of Bill Ayers and Bernardine Dohrn is equally odious. Yet, we see the same tendency in the failure of publications like Politico to even hint that there is anything wrong with going to work for Al Jazeera, the mouthpiece for the Muslim Brotherhood and al Qaeda. Politico’s Dylan Byers has served as a bulletin board for anything Al Jazeera feeds him, such as his “Al Jazeera is Hiring” story. We have a media that will not or cannot recognize the nature of the terrorism that claims the lives of Americans here and abroad. It doesn’t seem to matter if the terrorists are communists or Islamists. And when the terrorism occurs, such as in Boston, CNN contributor Juliette Kayyem, a former Obama Administration official, balks at designating the Islamists in the case as Islamic terrorists. Kayyem has now weighed in on the subject of the State Department apparently deciding to keep Cuba on its list of state sponsors of terrorism. “We ought to reserve that term for nations that actually use the apparatus of statehood to support targeting of U.S. interests and civilians,” she told the Los Angeles Times, in an effort to whitewash the Castro dictatorship and its support for terrorists like Chesimard. The Times reporter, Carol J. Williams, also insisted Cuba was out of the terrorism business. She did not mention Chesimard, except for a reference to the Castro brothers giving “refuge to a few fugitive radicals from the Black Panthers…” Nothing was said about Chesimard murdering a New Jersey State Trooper and fleeing to Cuba with the help of the Weather Underground. This is par for the course for a media that want to play down or distort threats to our safety and security.